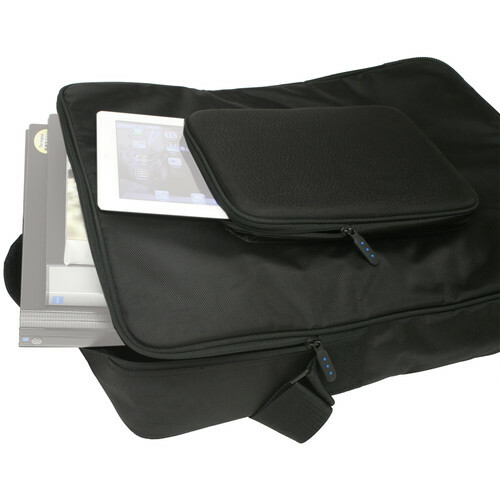 11 x 17" 18 x 24"
This black 14 x 20" ProFolio Art Carrier Deluxe from Itoya is designed to carry oversized materials; such as, sketch pads, a large canvas, presentation boards, or a framed piece of art. Artist and photographers will find this lightweight bag easy to carry with the top handle and shoulder strap. The zippered top secures all the materials inside, and the luggage grade nylon will protect all the materials during transport. A padded external pocket, located on the front, will carry all or your pens, markers, brushes, and even a smaller sketch pad. Box Dimensions (LxWxH) 21.1 x 16.1 x 3.5"
ProFolio Art Carrier Deluxe (14 x 20") is rated 5.0 out of 5 by 1. Rated 5 out of 5 by HappyCamper from Great Potfolio I purchased this portfolio to carry my? 12x18 shooting target to the target range. They fit perfectly. As for the quality and design of the case, I'm very impressed. It's super high quality and the carrier strap is a nice addition allowing you to carry by hand or over the shoulder. I'd definitely buy this brand again.